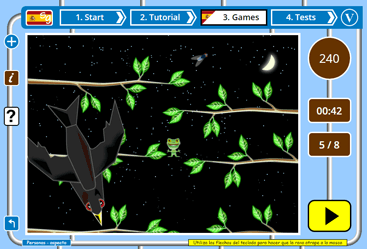 The frog flies - learn Spanish with the little frog! Each item in a topic consists of the text (both the written Spanish text and an audio recording of a Spanish person speaking the word / words) with a picture that illustrates that item. The illustrations are very simply and nicely drawn so there will be no confusion as to what is being shown. The texts are available to see and hear on all product pages in this brown info sign below the main interface. The language for each topic is carefully selected to match the language of the UK Spanish as a second language curriculum. This means that if you are at school you should see the same language you are learning there for any particular subject. The topics, both beginner and intermediate, match with the topics available in our free online teaching Spanish product Teach Spanish. Once a topic is selected at the beginning of a session at Spanish Games it will be remembered when you move between games and other activities. So you only need to choose a topic once and can then do multiple lessons, play multiple games and take multiple tests without having to select your subject topic again. See the help box below for instructions on choosing a topic here at Spanish Games. Choose either Beginner or Intermediate level topics in the red sign. Now the categories for that level will load. Click on any sign to view the topics that fit the category description. For example, if you choose the Beginner category 'Animals' you will see a choice of two topics: "Animals - pets" and "Animals - farm". When you click on the name of the topic, the pictures, writing and spoken Spanish for that topic will load (once the topic has loaded it will be available for all activities and will not have to be loaded again). 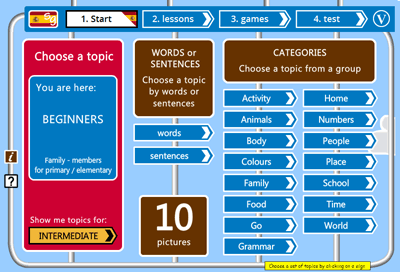 With the topic loaded you can choose whether to proceed to the lesson for that topic, or to jump straight to the games (tablet users are taken straight to the lesson when they choose a topic). Click the flag to learn the Latin American Spanish spoken in countries like Mexico and Argentina.